Warning: You might get dizzy due to chevron fever after reading our zigzag-filled gallery! Chevron is famous for it’s modern and chic design, and this design has been spotted in nearly every aspect of the consumer market. From cookies to socks, the chevron trend madness is surely growing and becoming even more popular and high in demand. Even though the distinct chevron pattern has been around for many years, it’s sudden popularity has given it much exposure to the world, especially the indie world. 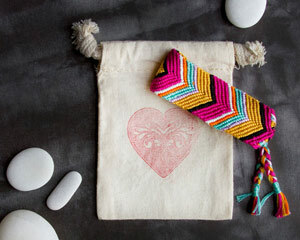 Check out our guide of chevron-patterned, handmade items, and be part of this incredible trend! This chevron pattern has allowed many indie crafters and sellers to be creative and produce wonderful, attractive items for any age group. 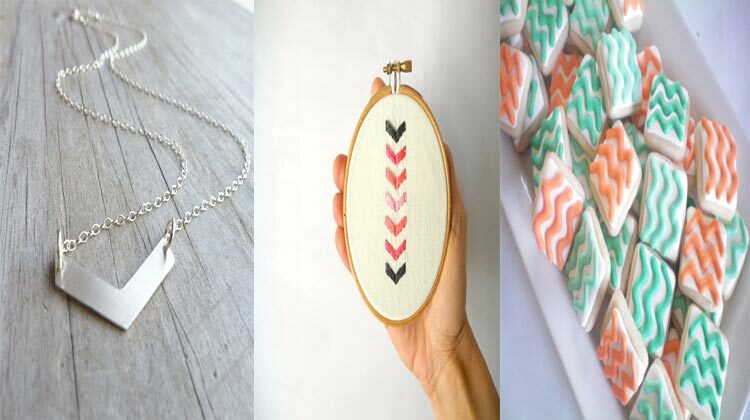 Whether you want to find something special for yourself or as an appreciation gift for a friend, get something trendy from our chevron pattern dedicated list! 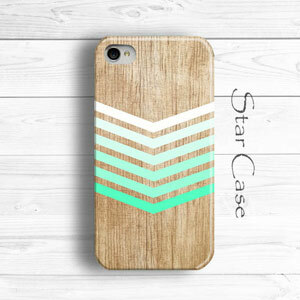 Charm your iPhone with Star Case’s chevron and wood printed phone case! 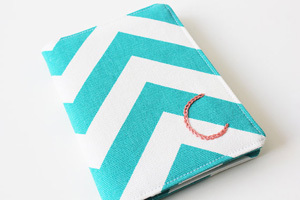 This chevron design is in a mint ombre color pattern and also comes in a white ombre version here. The wood print background for the chevron design makes this iPhone case boho-chic and charmingly rustic. With the use of high quality machinery, the chevron and wood print on this iPhone case presents a glossy finish that is waterproof and fade resistant. This case is available in sizes for iPhone 4/4s and iPhone 5. 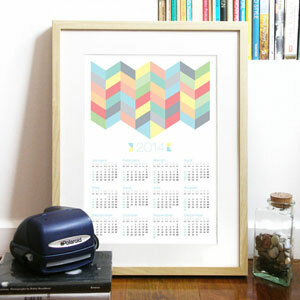 Keep track of your time in a stylish way with Peanutoak Prints’ chevron designed 2014 calendar print! With the mellow, pastel-colored chevron pattern, this A3-sized calendar makes for a fitting wall decoration in any room and color scheme. This calendar print is also available in larger sizes if you would like a bigger print. 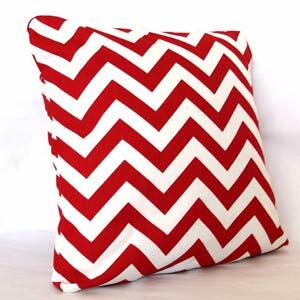 Decorate your home with Pure Home Accents’ bold and trendy red chevron pillow cover! Perfect for holiday decoration or year-round home decor, this red chevron pillow cover can accommodate your home decor needs. Instead of a zipper closer, this pillow cover has an envelope closure that makes it easier to slip your pillow in or out or put cotton filling in without getting it stuck in the zipper. 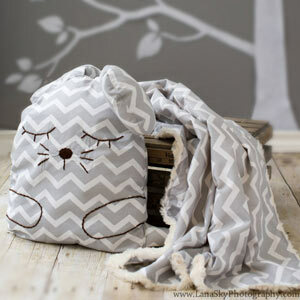 Wrap your baby in KIDZCOZY’s soft and cozy grey chevron blanket! This set also includes a mouse pillow that’ll make a wonderful, snuggly companion for your baby or toddler. With the grey chevron patterned fabric, your little one will stay stylish and warm. Since the mouse’s face and hands are hand-stitched, you won’t have to worry about your child swallowing any small parts on accident. Find more friendly and adorable cozies in KIDZCOZY’s shop. 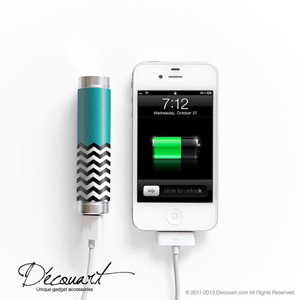 Charge your phone in style and be more friendly to the environment with Decouart’s chevron-patterned, portable external battery charger! This external battery charger allows you to charge your phone to 100% and comes in various designs. With this specific listing, you will receive a teal-colored, black and white chevron-patterned battery. Show your tight bond with your best friend with The Hootin’ Owl’s chevron-patterned friendship bracelet! This bracelet displays coordinating colors of fuchsia, orange, mustard yellow, black, white, lavender and turquoise. Coming in a 1-inch thick form, this friendship bracelet is a bold way to show off this stylish accessory. Want friendship bracelets in other colors for your other best friends? Check out the rest of The Hootin’ Owl’s shop to find more bracelets in various color combinations. Give your computer space at work or at home a personalized, fashionable look with Lone Star Accessories’ monogrammed, chevron-patterned mousepad! 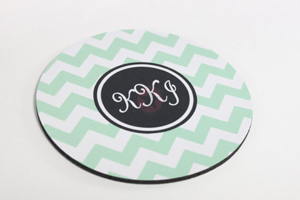 There are ten different colors available, from teal to black, and you can also personalize the initials or word phrase you want on this mousepad along with the font. In a round shape, this mousepad will surely look modern and trendy next to your laptop or desktop! Spice up a birthday party, baby shower or any other special occasion with Fiddle Sticks Party Boutique’s printable, lavender-colored chevron party package! You can personalize this party package with words and phrases you’d like to use for your event. A door sign, cupcake wrappers, water bottle labels and invitations are just a few of the goodies you receive in this printable party package. 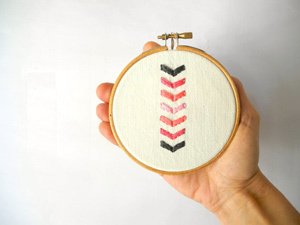 Add a touch of chevron in your home with Hoopsy Daisies’ chevron arrow embroidery hoop art! With a combination of dark grey, fuchsia and light pink floss, this embroidered chevron pattern can be a lovely addition to a nursery or little girl’s room. A brass screw at the top is attached to this hoop to easily place on walls or set on a stand on a book shelf. 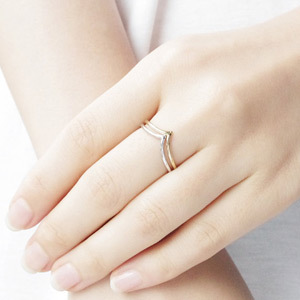 Simple and dainty, BK & Jio’s stacking chevron ring set is a fun and trendy way to decorate your hands. Three metal color options are available for this two-ring set: silver, gold and rose gold. You can order two rings in the same color or have each in a different color, allowing you to wear the rings with any outfit at any time. Having a birthday party or get-together with your gal pals? 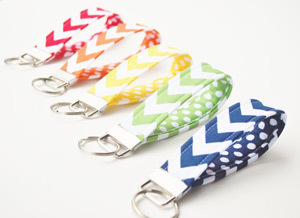 Thank them for their attendance with Brooklyn Love Designs’ set of five rainbow chevron key fobs! This set includes a red, orange, yellow, green and blue key fob with chevron patterned fabric on the outside and polka dots on the inner part of the key fob. Perfect for keys and wristlet clutches, these key fobs allow you to easily find and keep your belongings secure. 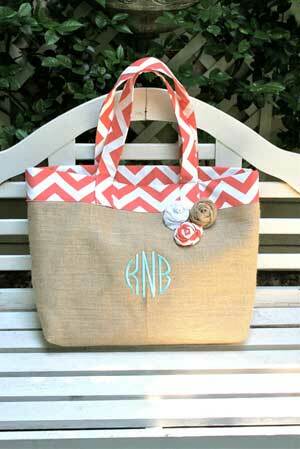 Get ready for a summer filled with beach vacations with 3 Little Mustard Seeds’ personalized burlap beach bag! This beach bag features coral-colored, chevron-patterned lining on the bag and handles, three quaint fabric flowers and a trendy monogram that you can personalize. The monogram comes for free with this listing, so you can personalize it with the font style, initials and thread color of your choice. 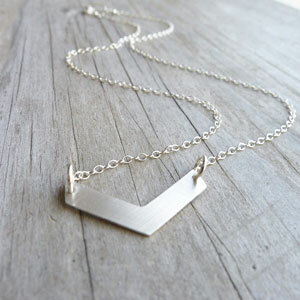 Dress up your outfits with Camilee Designs’ silver chevron necklace! Simple and modern, this necklace is made from sterling silver and goes with any outfit you wear. You can also order this necklace in goldfill. With a 17-inch long chain, this necklace is great for those who love medium to long length necklaces. 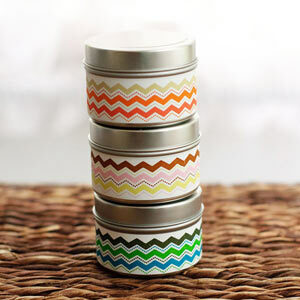 Dot your home with chevron-patterned candle tins from Inkspot Workshop! This listing includes three candle tins with various color combinations of the chevron pattern. Scented with lavender or citrus essential oils, you get to choose the best scent for these soy candle favors. You can also get these candle tins personalized to commemorate a special event. 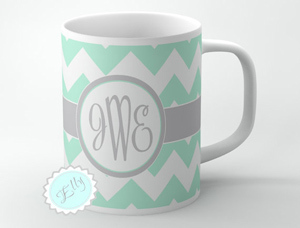 Enjoy your morning coffee or tea with Butterfly Ghost’s chevron-patterned mug! Featuring an elegant, customizable monogram and sophisticated mint & white color combination, this lovely mug makes for a great present for yourself or for a dear, coffee-loving, tea-obsessed or mug-collecting friend. This mug comes in an 11-ounce size and microwave safe. Find more colors for these chevron-patterned coffee mugs in Butterfly Ghost’s shop! Long day at work? Rest your eyes with Flax Creations’ cooling and heating pad eye mask! Filled with flaxseeds and lavender, this eye mask provides a relaxing and soothing way to heal puffy, tired eyes. With flaxseeds in this eye mask, you’ll have your heated eye mask for longer thanks to the high oil content found in flaxseeds. You can also receive this eye mask without the lavender if you are only interested in the flaxseeds filling. 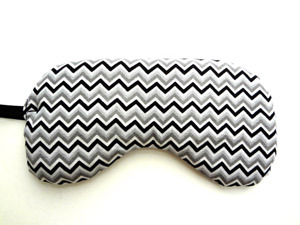 With a chic black, grey and white chevron pattern, you’ll also feel super stylish as you rest with this eye mask on. What better way to enjoy the super popular trend of chevron than to munch on Stephanie J.’s Creations’ chevron-patterned cookies! 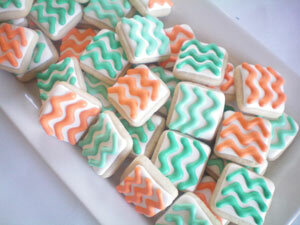 Cut into miniature, bite-sized squares, these sugar cookies are covered in professionally made white icing and designed with colorful chevron patterns in various colors. You get to choose up to three colors for the chevron stripes, which will make it more customizable for any special events you’re throwing. Four dozen cookies are in this delicious listing. Make writing down your personal thoughts and feelings extra special with Our Little Messes’ personalized, chevron-patterned journal! Thick with 110 sheets of blank, white paper, this journal gives you all that you need to jot down your thoughts, ideas, feelings, sketches and more. The journal cover is made with a chevron-patterned fabric and has a solid-colored band that wraps around the middle of this cover. You can choose from several color options for the cover and band. With a handy ribbon bookmark attached to this journal, you’ll always be ready to write down anything that goes on in your mind, heart or soul! With Simply Whimsical Gifts’ gold & navy blue chevron-patterned apron, you’ll want to bake and cook all day long! This half-apron comes in a vintage-inspired, scalloped design. 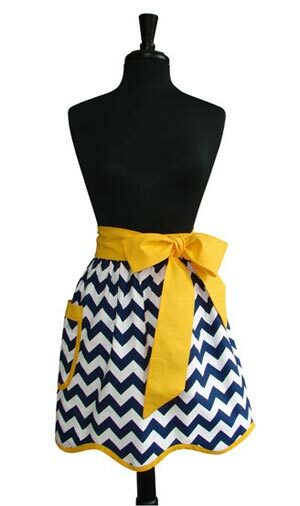 With the navy blue and white chevron patterned fabric and gold lining and bow, the colors of this apron are well coordinated, making it an eye candy worthy accessory when you’re in the kitchen. Find more fun aprons in Simply Whimsical Gifts’ shop! 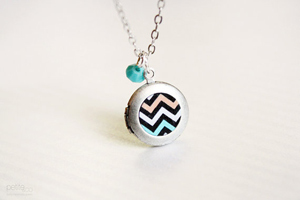 Charm your outfits with Petite Co.’s dainty chevron silver locket! This round, silver locket presents a chevron print in black, coral, mint and white and opens up to reveal a secret place for your miniature treasures. A light blue Czech bead is attached to the necklace to enhance the look and appeal of this silver locket. A gold version of this locket can be found here in Petite Co.’s shop. Protect your passport and other important identification cards in a trendy way with Anelisa’s chevron-patterned passport holder! This passport holder has a special embroidery with your chosen initial, making it more personal to you and can be easily found. 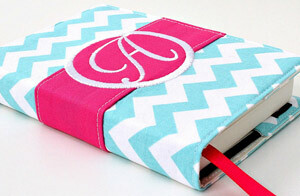 There are other chevron-patterned goodies in Anelisa’s shop, such as these business card holders or makeup bag. Give your camera a makeover with The Sweet Strap’s chevron-patterned camera strap! 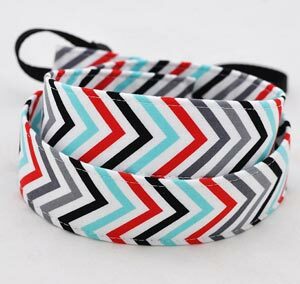 This strap displays a chic color combination of grey, white, light blue red and black. With a 32-inch length, this sturdy camera strap allows you to comfortably carry and secure your camera near you. The chevron pattern has been used and molded into many shapes and sizes yet it will always keep its bold and stylish trait. Even though it’s a super trend now and can be in the “out” pile any time in the fashion world, there will always be admiration and love somewhere for this prominent design. Be sure to check out our indie coupon directory for great finds and deals on handmade goodies! Written by Emily Nguyen, a core contributor to NerdWallet Shopping.